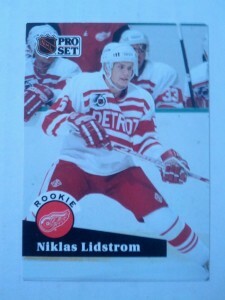 That’s a 1991-92 Pro Set #531 Niklas Lidstrom Rookie Card. It’s not worth much; the book value is $1.00, and it’s not a team or player I particularly like. I mean, I like Lidstrom, he’s the only guy in my mind who comes close to Bobby Orr in terms of best NHL defensemen, but he played for the Wings and just isn’t a guy I would collect. More than that, I have cards worth much more than a dollar in my collection. I have cards in my collection that are so rare that Beckett, the pricing authority on all things card related, won’t even take a stab at placing a value on them. This card, though, this basically worthless picture of Mr. Lidstrom, is my favourite. I’ll tell you why. I’ve had this card for a long, long time. 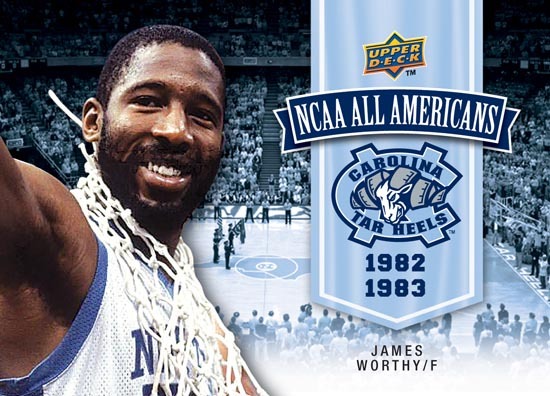 Since sometime in the spring of 1992, I believe. Hockey cards were huge back then and everyone, old and young, was collecting them. 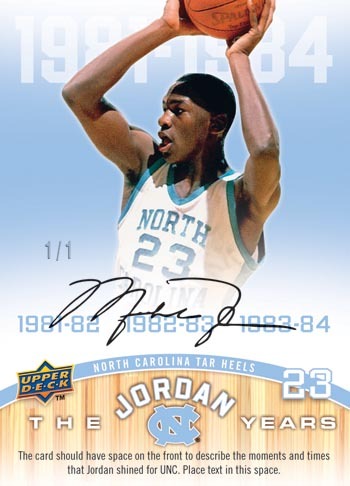 I was 6-7 years old and all I wanted to do was pull a Rookie Card out of a pack. I had bought several packs with my allowance, but was never lucky enough to pull an elusive RC. One day, I found myself in front of the comic shop with a couple of bucks in my pocket and my mom let me go buy a couple of packs. I remember it like it was yesterday. I bought two packs of Pro Set, and waited until we got home. I went into my room and opened the first pack. A few cards in I saw a Red Wings logo and the word “ROOKIE” over the name of some dude I’d never heard of. I was over the moon. I finally pulled a Rookie Card! It didn’t matter. “Niklas” came first. Fast forward about 20 years and I find all my old cards in the back of a closet. I start going through them and I see all sorts of rookie cards of stars; Mike Modano, Jaromir Jagr, Martin Brodeur, Sergei Fedorov and others, and all I could think was, “Wow, what are these worth?” (for the record, other than the Brodeur, nothing.) Then I flipped to the next card, and there he was. 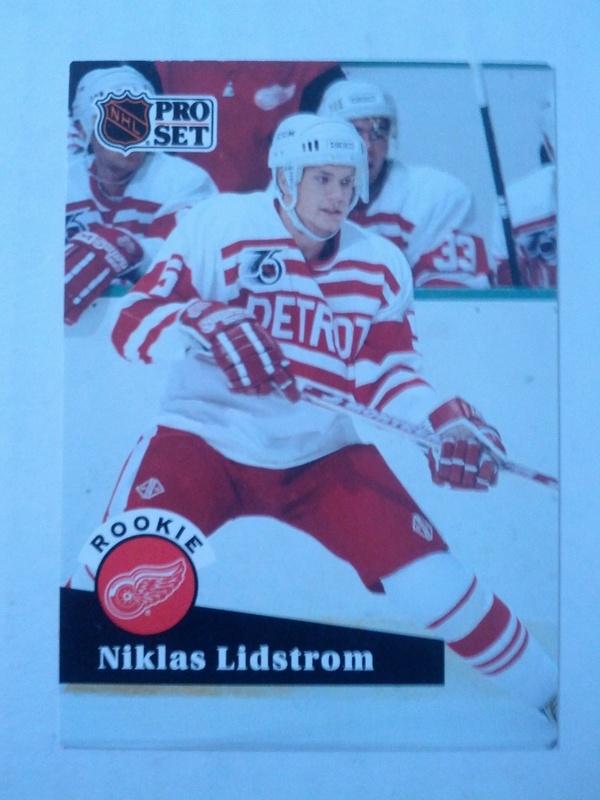 I saw that Niklas Lidstrom card and it all flooded back. I was 7 years old again and I loved it. Since then, I’ve started collecting again and, as I’ve said, I have some nice, valuable cards in my possession. That Lidstrom card, though, is still the centre piece and cornerstone of my collection. That is why, even if I had the money, I have no interest in buying the vast and incredibly impressive collection put together by Simon Bourque of Quebec. Bourque, now 61, began collecting hockey cards as a child and never seems to have stopped, until maybe now. Bourque is putting his collection up for auction. This doesn’t seem like such a big deal until one considers what exactly this collection is. Classic Auctions, the auction house who sold Paul Henderson’s 1972 Team Canada jersey for $1.3 million, is selling Bourque’s collection, and expect to hit well over $1million when all is said and done. What cards could possibly go for that? The cards that should be going into a museum or the Hockey Hall of Fame. You see, Bourque’s collection spans from 1910 to the early 1940s. That doesn’t allow for the iconic 1951-52 Parkhurst set with RCs of Maurice Richard, Gordie Howe and many other all-time greats, but how does a 1911-12 Georges Vezina RC sound? Or how about a 1925 Newsy Lalonde graded “Mint”? A 1911-12 “Phantom” Joe Malone RC? Maybe you just want the Fred “Cyclone” Taylor card from the same set. I would love to own these cards. Not only are they rare and valuable, they are a history lesson of the sport of hockey. 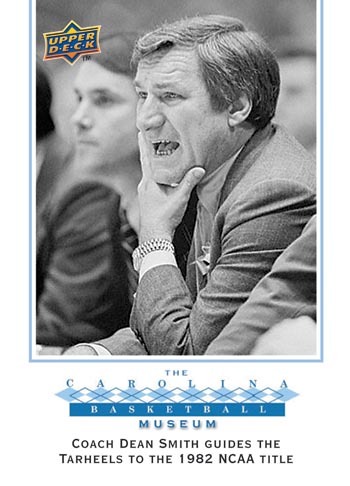 A look at the people who built the sport up to the heyday of the 1950s. It’s also a history of sports card collecting. When I was a kid, cards were becoming a product in their own right. Before my time, they were a way to sell gum. Simon Bourque’s collection shows they were initially an extra with your cigarettes and chocolate. In fact, there’s so much history in here, this collection even includes what can arguably be called the first short-printed card of all time. Today, in the card collecting hobby, short printed cards are all over the place. There are thousands of cards bearing the markings /10, /9, /3 even 1/1. In the collecting world, this is seen as a relatively new practice, which has become quite mainstream over the past 5-10 years. Card companies do this now because collectors want to pull these rare cards and knowing they may be in a given box will sell that box. In the 1923-24 season, though, the William Patterson Company was giving away free skates to whoever could put their set of cards together. To avoid giving away too many, though, they short printed the first card ever, #25, Bert “Pig Iron” Corbeau’s RC. There’s one of those in this collection too. The reason I have no interest in it is the reason I collect. In an interview, Bourque mention “passion” as a word when describing his childhood hobby. He collected for the love of it. He loved collecting, he loved hockey and that’s why he has all these cards. He was a true collector, not hoarding cards as an investment, though they turned out to be a damn good one, but because he loved them the same way I, and all collectors do. If one has the money, it’s a decent investment, but I don’t want my hobby to be an investment. A hobby is supposed to be fun, relaxing and rewarding. While I do buy and sell online, I am never looking to make a profit, just to keep my habit hobby going. Trying to profit on a hobby turns it into a job, and I don’t want it becoming one. At the same time, as cool, rare, valuable and historical as these cards are, they don’t mean anything to me personally. The players whose cards I do collect are either local guys I grew up with, such as Barry Brust and Justin Schultz, while others are favourites from my childhood or now, like Trevor Linden and Chris Higgins. The point is I don’t collect Vezina, Lalonde or Malone. Would it be nice to own these cards? You bet! I’d sell them in a second and roll around in the money! But that’s it, other than their cash value, they’re meaningless to me. They’re not players I ever got to watch, some of the teams I was not even alive to see, and we’re not talking Kansas City Scouts or California Golden Seals here. I don’t want to buy Simon Bourque’s childhood, I’m busy trying to acquire my own. Print article This entry was posted by Pheebs888 on October 17, 2013 at 4:01 pm, and is filed under Articles Contest, Contest Articles, Contest Entries. Follow any responses to this post through RSS 2.0. You can skip to the end and leave a response. Pinging is currently not allowed.